Former Garden Street resident Jimmy Reed greets friends while sitting outside reunion host Janine Bergin’s house. Jimmy Reed, 78, stands in front of his childhood home on East Austin’s Garden Street. It has been stripped to the 1920s wooden frame, and the barely 800-square-foot home looks more condemned than livable. Reed lived here, he estimates, from 1942 to 1953, with his seven siblings and parents. They were a big bunch. But at the time, the people who lived on Garden Street between Waller and Navasota streets – particularly those who lived in the six cottages surrounding the Reeds’ home – were all one big, swollen family. Reed motions to the front lawn. Come June, the first of these seven homes will go on the market – for roughly half a million dollars. Loved Homes, a local home restoration company, is rehabilitating them. For now, onlookers have to use some imagination to picture how these stripped-down, hollowed-out homes once housed lower- to middle-income families. This mind exercise is hardly strenuous for the two dozen or so senior citizens standing on the front lawn of Reed’s former house on a sunny Saturday in March. Most of them are previous residents of this stretch of Garden Street, and this year marks the eighth in which the group has officially convened at the home of East Austin resident Janine Bergin. Photos of the Reed family on the wall at their childhood Garden Street home. Bergin, who lives across the street from the former homes of Reed and the others, tells the story of how she came to host the event: A little less than a decade ago, her curiosity got the best of her. “I was sitting on my porch one day, and I noticed two people park their car and walk very slowly up and down the sidewalk,” remembers Bergin. Those two people were Kirt Reed and his sister Margaret, both siblings of Jimmy Reed’s. The siblings had been organizing a reunion in North Austin but were looking for a better location – one closer to their actual childhood homes. That’s when Bergin stepped in. “I said, ‘Well, you should have it here,’” remembers Bergin. Her house sits right across from the seven cottages, so each year when former residents come to chat and snack on her porch, they are also able to eye their parents’ homes from a distance. The gatherings have been a gift that Bergin thought would be lost when Loved Homes bought the land on which the cottages sit. The company bought the properties in January for $1.5 million. “We felt certain (the homes) were going to be torn down and made into condominiums or a very high-density project,” she says. With the help of a walker, Marie Reed, older sister of Jimmy and Kirt, studies roughly a dozen photographs of her family taken during the decade they lived in the house on Garden Street. But Loved Homes President Dimitri Hammond says he’s not in the business of perpetuating the current practices of East Austin real estate: scrapping the old to make room for the new. Hammond and his partners, Kyle Christian and Ryan Gullahorn, agree there’s more profit to be made in building new. But the three hope their work will impress upon other developers the potential return of restoration. Hammond estimates that once the homes hit the market later this year (each priced between $400,000 and half-a-million dollars), Loved Homes will have spent $2.3 million dollars making these seven cottages livable. Do the math, Hammond says, and it shows that investors will net a 20 to 30 percent profit. Lois Martz, 83, laughs when told the sticker price of her family’s former home adjacent to the Reeds’. During the 1940s, she lived with her parents and six siblings on Garden Street. At one point, her family paid $12 a month in rent, she says. 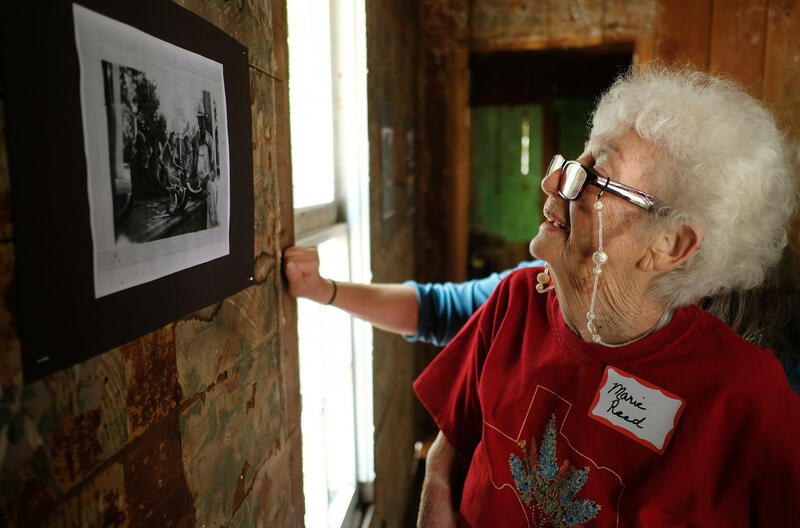 She calls the homes “a starting point, really, of memories.” With the news of the restoration, this year’s reunion has felt like a real celebration. Martz says her mind has always granted her unfettered access to her childhood home. But walking around the home now, in real life, the memories sharpen – and sting. Although these homes are being restored, it’s quite possible that they will look decidedly different than the houses Reed and Martz grew up in. The original rooms are tiny, meant to trap warmth in an era without central heating. Hammond describes how part of their work will be to open these homes up to create a more modern flow from room to room. The cottages, too, have aged – but they’re also getting a shot at a second life, much like the friendships of the people who once lived in them.